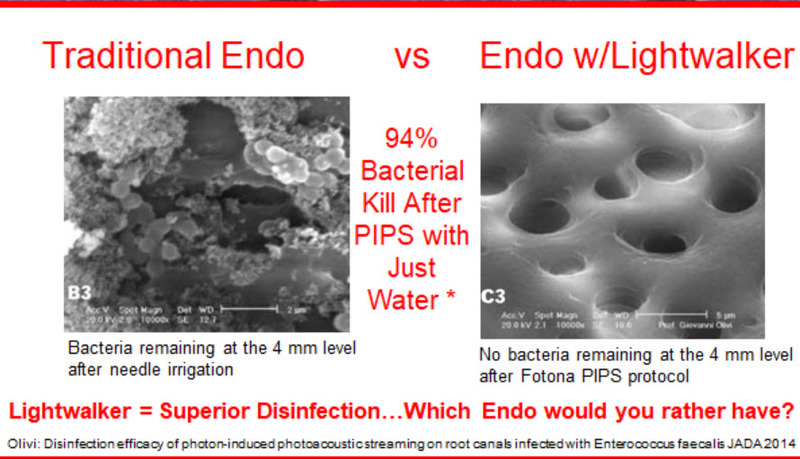 Advanced Laser Endodontic Therapy – What is it? Advanced Laser Endodontic Therapy (ALET) successfully addresses the two major disadvantages of traditional root canal therapy: the inability to clean and sanitize anatomically complex root-canal systems and to deeply disinfect dentinal walls and tubules. Why is ALET Superior to Classical Root Canal Therapy? There is no way classical root canal therapy can completely clean all the infection present in the root canals of a tooth. Dentists usually think that it is enough to fill the main canal of the tooth and their job is done. They can get a really good result for the main canal and miss the sometimes myriad of lateral, accessory and anastomoses (connectors) within the canal system of teeth. The problem is the tools dentists have had available to them are not efficient and don’t remove all of the bacteria and infected, necrotic tissue inside the tooth. 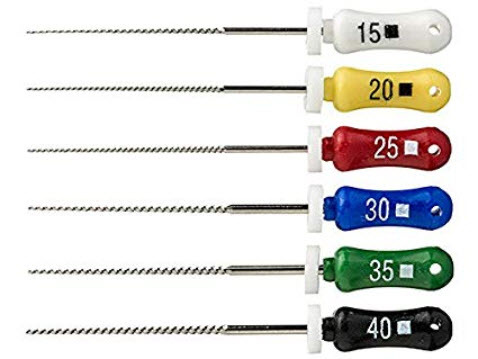 You have all heard of the adage, ‘Use the right tool for the job.’ Root canals traditionally have been done with small hand files (pictured below). Up till now, these have been the primary instruments available to do root canals and try to remove the necrotic tissue inside the tooth. Now there is another way, more on this later. Here is a picture of the files dentists use during root canal therapy. While hand files do a pretty good job of removing bacteria and infection from the main canal of the tooth, they do a poor job of removing the infected tissue in the other canals present in the root canal system. The simple reason for this is that these files cannot reach these canals. Imagine for a moment using one of the files to the left and trying to clean out the curved canals and channels in the tooth imaged above. First of all, it is anatomically impossible for these files to reach all the canals present. Secondly, the shape of the file does not match the shape of the canals present in teeth. Rarely if ever does a tooth canal present as a relatively perfect cylinder, oval or circle. Most canals turn and curve like a river, making it virtually impossible to navigate with these files. It’s the way of nature. The third reason classical endodontics (root canal treatment) doesn’t always work is the microtubules of the roots. Here is an electron microscope image of the root surface of a tooth. See all the tiny holes? These are microtubules which usually carry micronutrients into the tooth and house immune cells and odontoblasts that can lay down more tooth structure when necessary. When laid down side by side, the microtubules will span a distance of 1-2 miles. That is a lot of tubules! 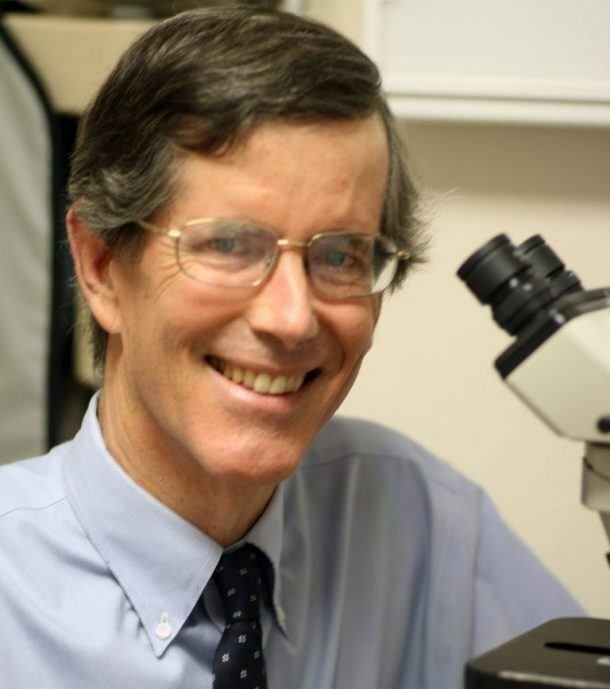 In Weston Price’s groundbreaking research done a century ago and George Meinig’s book, ‘The Root Canal Cover-Up,’ it was postulated that the microtubules were actually filled with bacteria and contributing to the body burden of toxicity in your body. Possibly leaving 35% of the tooth surface untouched after root canal therapy is a staggering thought. Imagine doing a root canal at your local dentist because you have an infected tooth and being told you’re good to go even though that the dentist was only able to clean 65% of your tooth. Would you consider that a success? I wouldn’t. No wonder root canals fail as often as they do. It’s because there is still bacteria left behind to fester in your tooth! 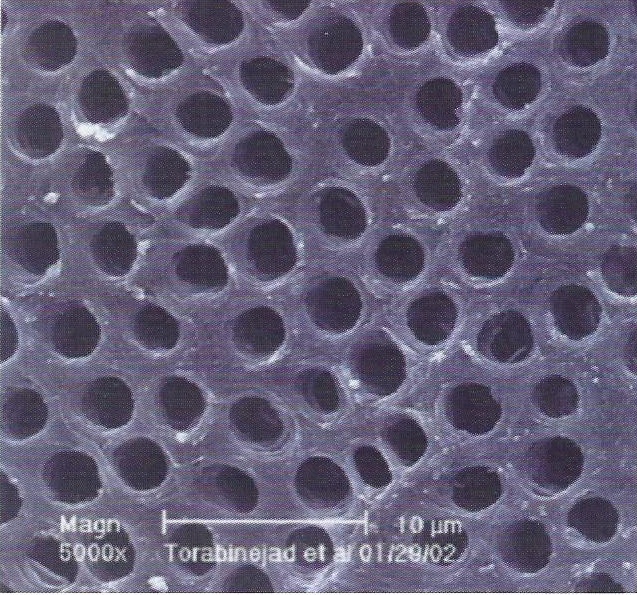 During Advanced Laser Endodontic Therapy (ALET for short) an Erbium laser uses a unique photoacoustic streaming method to create non-heat producing photoacoustic waves. Following this, the canals and sub-canals are left clean and the dentinal tubules are free of contamination and debris. In the second step, the antibacterial and oxygenating properties of ozone flush out and penetrate into the microtubules of the tooth. Research has shown that ozone is more effective at killing bacteria than even bleach, which is the traditional solution dentists use to kill bacteria during root canal therapy. At the end of treatment, an Nd:YAG laser wavelength is utilized to create bio-stimulation that helps to heal the gums and bone around the tooth. Take a look at the electron microscope images in this graphic. On the image to the left, you see the bacteria that usually gets embedded into the microtubules of the tooth root after a tooth gets infected and needs a root canal. On the second image, you see the microtubules after treatment with the Fotona laser in PIPS mode. There are NO MORE BACTERIA in the tubules of the root! Before now, we couldn’t be sure how much bacteria we were leaving behind when we did a root canal on a tooth. How would you know, as you can’t see them on x-rays? 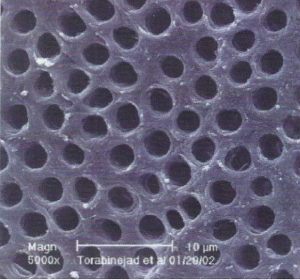 However, with the use of electron microscopy, we can actually show the microtubules and the fact that they are devoid of bacteria after using PIPS during root canal therapy. This is absolutely a game changer and a paradigm shift in dentistry, in my opinion. In my 33 years as a practicing dentist, I don’t think I have seen a more important development to resolve infections in the mouth. 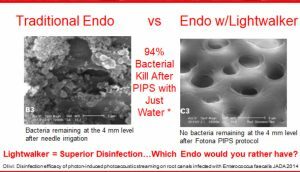 This is why I am so excited about this laser and specifically the PIPS and SWEEPS modes to remove bacteria from infected teeth. I think that Weston Price as well as George Meinig, if they were alive today, would be as excited about this technology as I am. OK, for the geeks out there like me who want to hear more about the technical stuff here goes: In PIPS and SWEEPS mode, the laser operates on a super-short 50-microsecond pulse duration. This combined with the specific design of the Erbium tip allows for the lowest possible energy per pulse and repetition rate. This minimizes thermal effects and maximizes the propagation of the photon-induced photoacoustic shock waves on a microscopic level. PIPS and SWEEPS are revolutionary laser frequencies for cleaning and disinfecting the root canal system. The strategy of using PIPS when combined with traditional irrigation as well as ozone water has the potential to fully heal previously unhealthy and infected teeth. Once we eliminate the bacteria in the tooth, the body can still maintain a biological connection with the tooth through the periodontal ligament. If you are local to San Diego, you can call Victoria and get set up for an evaluation with me to see if PIPS would help in your individual situation. Call her at 760-632-1304. To read more about laser root canals, here is another article on the subject: Should I Treat My Root Canal Infection or Extract My Tooth. Root Canal Preparation with a Novel Nickel-Titanium Instrument Evaluated with Micro-computed Tomography: Canal Surface Preparation over Time; Ove A. Peters, DMD, MS, PhD,* Claudia Boessler, DDS,† and Frank Paque´, Dr med dent†: Int Endod J. 2001 Apr;34(3):221-30. What is Advanced Laser endodontic therapy (ALET)? ALET is an innovative approach to root canal therapy, now made possible through advances in technology and a bio-friendly new protocol. It uses specialized rinses, ozone, and a dual Erbium/NdYAG laser to sterilize and sanitize the canals and tubules of the tooth and to stimulate healing. Why haven’t I heard of this before? Why aren’t other root canal specialists doing this? 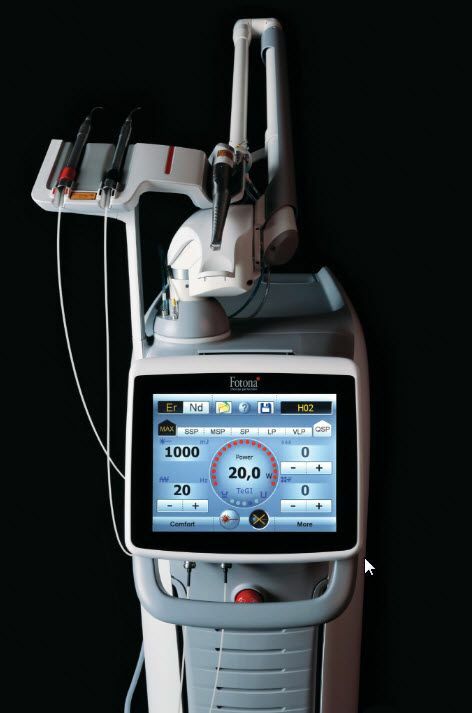 While the Fotona laser has been used with good effect for about a decade, the specific protocol currently being used by Dr ORielly is 1-2 years old. Most dentists haven’t heard of it yet! Why is this different from traditional root canal procedures? Won’t I still have a ‘dead tooth’ in my mouth? The tooth isn’t ‘dead’. Although after root canal therapy the canals are filled with inert material, the ligament around the tooth is still viable and vital. This ligament provides blood flow, nerve signals, and serves as a shock absorber for the tooth. As long as it is viable and present the tooth maintains its biological connection to the body. Why do I need two appointments for my ALET procedure with Dr. O’Rielly? On the first visit, Dr. O’Rielly opens up the canals and clears out the infection. Then he will give the tooth two weeks to maximize healing before finishing the procedure on the second appointment. He finds that using the protocol twice only improves his results and ensures all the bacteria and biofilm has been removed from the canals and tubules. Will I still need a crown? What if I already have a crown? If you already have a crown Dr. O may be able to go through it from the biting surface and maintain it by sealing it. Otherwise you will probably need a new crown. Each case is different. I read somewhere about Weston Price and his work with rabbits. I also heard about George Meinig’s book and what he says about root canals. What about that?